Size : 5.5 x 8.5 ins. This book has a total of 210 timeless selections, 140 are some very memorable bhajans and 70 are devotional kirtans. The bhajans and kirtans in this book were written by very great saints, sages and lyricists and sung by many popular artistes. A great number of these all-time great devotional songs were selected from classic Hindi movies. The music for these treasured songs was created by famous inspired musicians from the Indian film industry. These treasures were taken from our library of music; many tracks are still in 78 RPM Records. It is hoped that this humble presentation will meet your expectation. For inquiries on Bhakti Bhajan Mala Vol. 1 by Pt. Ashram Sharma in Trinidad and Tobago only please call (868-342-9951). This book emerged as a result of my undying love and appreciation for music. The aim of this book is to serve as a reminder of the enchanting Bhajans of yester-year. It is hoped that some of the older Bhajans will be re-born into our hearts, Bhajan sessions and daily lives. A great effort was made to bring forth the original versions, which are taken from the original tracks and which are available in my personal library of music. I humbly ask your forgiveness for any errors which may have been made. Bhajans have been part of our culture since time immemorial. They induce a desire to experience the truth, to glimpse the beauty that is God. In this age of fear and anxiety, Namasmarana (Chanting the name of God) is the only method of Liberation that is accessible to one and all. Namasmarana is the most effective way of cultivating Prema (Love). Let our hearts throb for God, as we glorify His name and form. Namasmarana can be done at any time in any place under any condition. In this age of Kaliyuga, Namasmarana is the only means to attain Moksha (Liberation). It is my humble hope that this work would be the instrument of happiness to all. Bhakti Bhajan Mala is a work of Love offered to the Lord, so that devotees would be able to access the Divine through Bhajans. All those who are fortunate to drink from this holy lake will experience inner peace and tranquility singing and chanting the divine name. 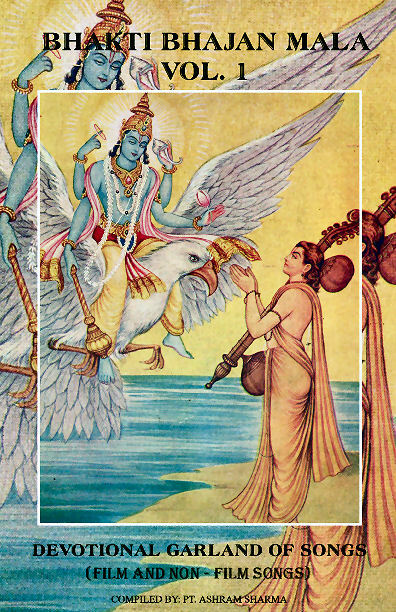 Once the devotee tastes this nectar he will be transported permanently to a state of Bliss. To place this work in every temple, school, university and home is installing the Lord himself. Society is eternally indebted to Pandit Ashram Sharma for his tireless efforts over many months and years to compile this priceless gem. 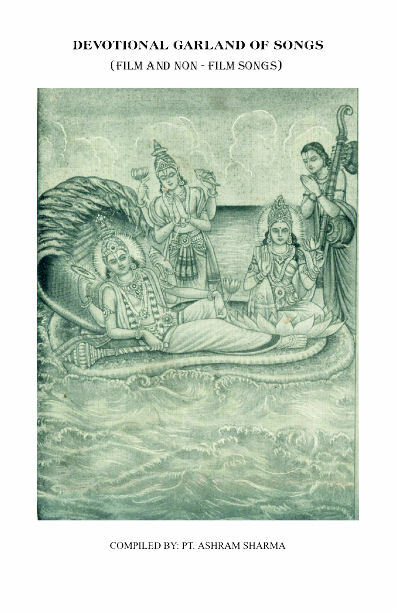 Natawara Ki Bhole Shankar Ki …..
Bandow Charana Kamala Raghunandan …..
Pawata Jana Bhaktana Ura Chandana …..
Papiyo Ko Papa Se Hai Tarati …..
Mohan To Hai Sabka Pyara …..
Ho Jai Lakshmi Raani …..
Jai Shiva Shankara Gowrishwar, Jai Raameshwar ….. Mere Naino Ke Nagariya Me Ram Hai …..
Usako Kyaa Roke Gaa Andhi Aur Tufaana …..
Keerati Kalita Lalita Seeya Piki …..
Pandit ASHRAM SHARMA was born in 1963, in South Trinidad in the West Indies. He is the grandson of the late Pandit Rambaran Tiwari, who migrated from Basti, U.P. 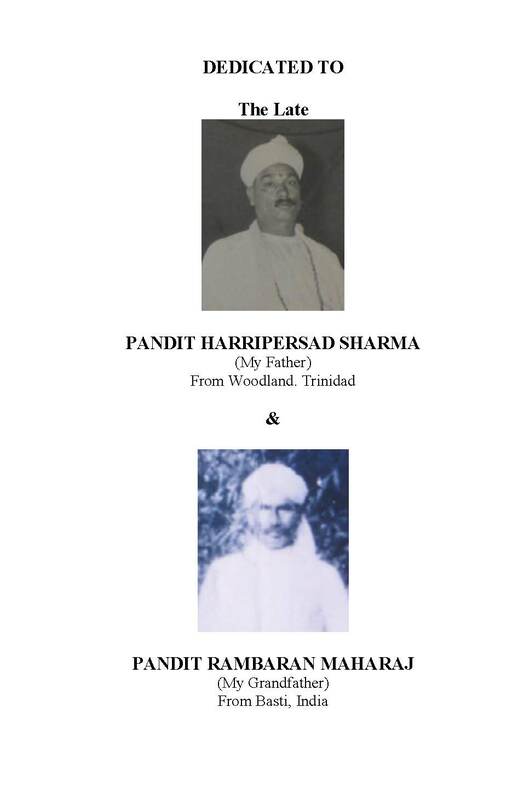 India to Trinidad in 1906, whose son the late Pandit Harripersad Sharma was the father of Pandit Ashram Sharma, who comes from a family very steeped in dharma and anchored in spirituality-exponents of Sanatan Vedic Dharma. Music, art, poetry and divinity run through the entire family in an unending stream irrigating and watering the lives of many devotees. Panditji is a student of the late illustrious Pandit Jadoonanan Misra and the formidable Pandit Mahase Maharaj who infused in him the immortal treasures of divine knowledge and music. In his quest for excellence Panditji travelled far and wide to India, Canada, United States, United Kingdom, South America, Guyana and elsewhere and interfaced with many masters like Manna Dey, Mahendra Kapoor, Mehdi Hassan, Hari Om Sharan, Suresh Wadkar, Pandit Shiv Kumar Sharma and others who had a tremendous impact on his life. To this end Panditji is the virtual repository of music, art and culture perpetually flowing in his veins and which continue to sustain his breath of life. Panditji has a voluminous treasury of bhajans, kirtans, geets, ghazals, qawalis, film and non film songs which are ornaments of his very life.